Folgers Classic Decaf Office Coffee. This is the Decaffeinated version of the country's most popular coffee. Rich, smooth with a nice aroma. Another quality product from Folgers Coffee. 42 Count Case - Individually sealed and packaged for perfect measurement and freshness. 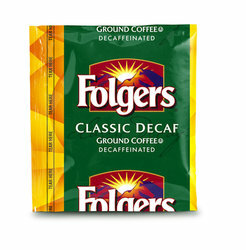 Each pack contains 1.50 oz of Fresh Folgers Decaf Coffee.